◎Add Extra 100% Juice For Galaxy S7/S7 Edge – ONLY compatible with Samsung Galaxy S7/S7 Edge!!! 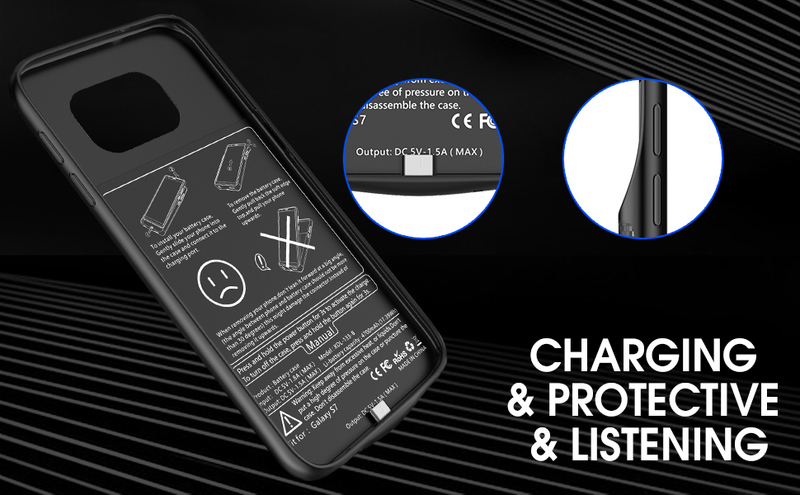 Built-in 5000mAh huge capacity Li-polymer battery, offers an extra 100% battery life for your phone effectively, made of TPU and PC material, This battery case has the highest industry regulatory certificates: CE, RoHS, and FCC. ◎Simultaneous Charging – You can charge your phone and case at the same time. 100% safe with internal circuit protection against overheating, overload and short circuit. Great for Christmas gift. 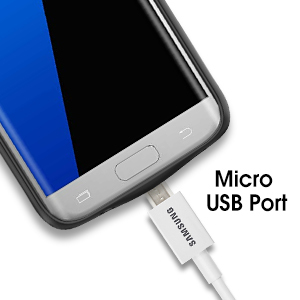 ◎Easy Installation – Slide your phone into the charging case to well connect the Micro-C USB port, press cellphone into the cover pack, easy to start/stop charging your phone by pressing the power button for 3 seconds. 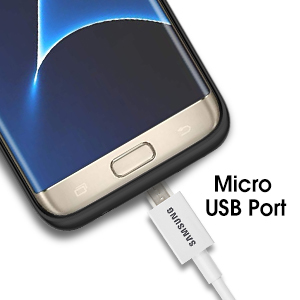 ◎Smart LED Indicators – 4 LED power lights to allow you to accurately keep track of remaining power in your battery case(0–25%–50%–75%–100%), The LED light will flash when case is charging, but don’t flash when the case charge the Galaxy S7/S7 edge, The LED indicator will stop flashing when the battery is full of power. 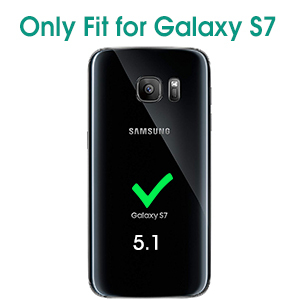 ◎100% SATISFACTION WARRANTY – Lifetime Warranty ensures you are protected for the life of this product Galaxy S7/S7 Edge portable power case or service, If you have any problem, feel free to contact us. You will be offered help from our iZamZam Customer Support Team within 24 hours. GREAT GIFT IDEA: Perfect for Valentine’ day, Thanksgiving Day and birthday gift for family member and friends. 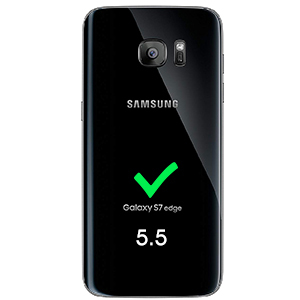 Note: The Galaxy s7/S7 Edge battery case only can extend 100% battery life for your original battery. Important Warning: This extended battery case only compatible for Galaxy S7/S7 Edge（Include Galaxy S7, G930 (USA), G930F (Global), G930FD (Asia), NOT for Galaxy S7 Edge and Galaxy S7 Active! One case, two function – protection and charging. iZamZam Case Battery extended more than 100% your Galaxy S7’s battery capacity. 4 LED light indicates the exact power juice of the case. 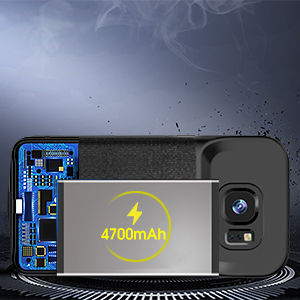 4700mAh high-quality lithium polymer battery designed for long durable(500+ cycles). Soft TPU material and sleek texture back up cover offer a great grip experience. Start or stop charging by just one-click of the power switch button for 3 seconds. The LED indicator will stop flashing when the battery is full of power. 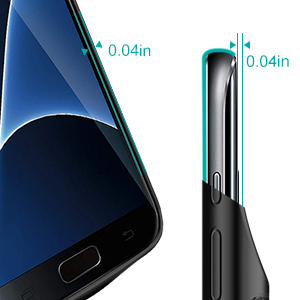 The LED light will flash when the case is charging, but don’t flash when the case charging Galaxy S7. FCC, CE and RoHS: meets all consumer regulatory requirements in the United States and the European Union. 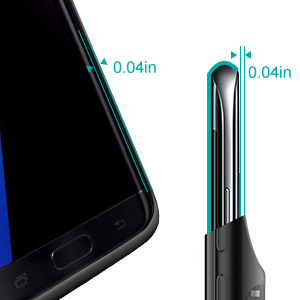 The LED light will flash when the case is charging, but don’t flash when the case charging Galaxy S7 edge. I been using this battery case for the past 4 weeks and looks promising. It charges my phone at least two times and very slim light weight. You may feel it heavy first time but you will get use to it. Also, give a nice look to your phone. I will buy another one for my wife galaxy. Not bad at all for the price. Great case to have if you run out of your battery in the middle of the day. Specifically with heavy phone users .